Media educator. Global connector. Pretending to adult. 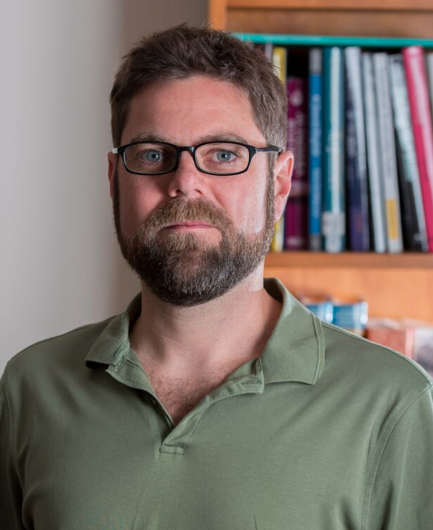 Scott Bridges has worked in the media, written books about the media, and is now studying it for his PhD. He is also the co-founder of the Australia-Middle East Journalism Exchange which is about raising the quality of journalism. Australia-Middle East Journalism Exchange (AMEJE) is a not for profit organisation that strives to improve cross-cultural understanding between the two regions by fostering better informed journalism. We’re still a very young company — barely one year old — but our mission is to become an enabler of positive change in Australian and Middle Eastern journalism, and an indispensable resource for journalists in both regions. We’re focused on journalism because news plays a central role in shaping people’s perceptions of the world by mediating much of their exposure to it, and because poorly informed journalism undermines the public’s understanding of foreign peoples and cultures. One of the main drivers of the establishment of AMEJE was our observation that Australian media portrayals of the Middle East are often simplistic and clichéd, and the same applies in the other direction. While we have a lot of exciting plans at various stages of development, our main focus at the moment is a flagship program of professional and cultural study tours for student journalists. Although you currently live in Australia, you have worked, travelled throughout, and written a book about the Middle East. Was there a particular moment, or experience that sparked the idea to create AMEJE? I can’t think of a single moment. It was more like a growing sense throughout 2014 that a lot of the journalism I consumed was oversimplifying complicated issues and lacking nuance. The Middle East in the Australian media can seem at times like an endless stream of quick-hit, shallow yarns about conflict, Islamic radicalism, and dictatorship. While the region obviously has its fair share of that sort of stuff, focusing on those topics alone draws a one-dimensional caricature that overlooks the Middle East’s rich texture of cultures, societies and human stories. Similarly, I know from my time in the Middle East that Australia is represented in the news in much the same way (if at all) — a Syrian friend once told me that Australia in the Arab media is represented as nothing more than just another military force involved in its conflicts. Hopefully AMEJE can make even a small difference in how the news media in each region reports on the other. Earlier this year you ran an AMEJE study tour throughout the Gulf – what was the objective of that? Will you be bringing delegates from the Middle East to Australia in the future? 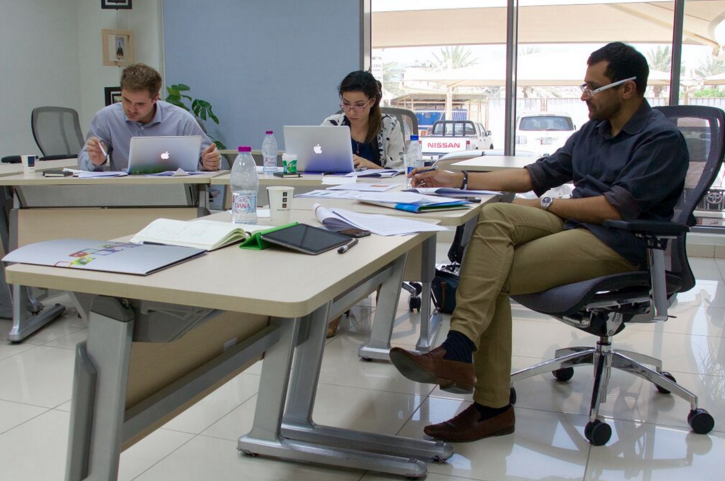 The purpose of the 2015 study tour was to immerse delegates in a program of working visits to newsrooms and cultural institutions in the UAE and Qatar. Over the course of nearly three weeks, the delegates met with journalists, government representatives and everyday people; they gained personal experience of some Middle Eastern cultures and media systems; and they started building a professional network of contacts they can draw upon throughout their careers. Throughout the tour, under the guidance and mentorship of AMEJE staff, they critically reflected on the whole experience, produced works of journalism (including an article published by Fairfax), and put together work for assessment in the final journalism unit of their university degrees. In 2016 we’re planning a two-way exchange of delegates between Australia and the Middle East: we’re working to bring a group of journalism students from Qatar University to Sydney and Canberra, and take another cohort of University of Canberra students to the UAE and Qatar. 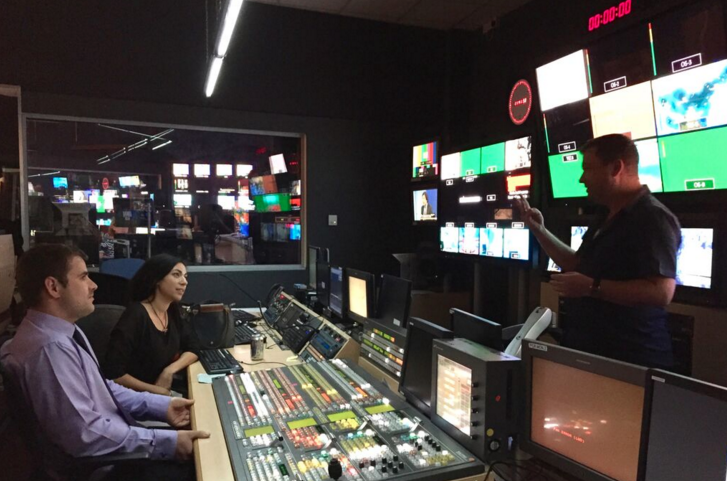 Al Jazeera presenter Kamahl Santamaria (left) takes study tour delegates Zac Schroedl (middle) and Scherry Bloul (right) on a tour of the Al Jazeera studios in the organisation’s headquarters in Doha, Qatar. Starting these types of organisations is always challenging – what has been the hardest thing about getting AMEJE off the ground? I’m pretty hopeless with grown up stuff — I struggle to manage an ABN and a personal tax return — so just the administration side of starting a company was traumatic enough for me, but I’m lucky that my colleagues and the other company directors are much smarter than I am so we managed to get everything roadworthy and legal. The time from decision to start the company, to day one of the inaugural study tour was about nine months. Looking back, I am still amazed that we managed to make it happen given the sheer amount of planning required, the number of moving parts, and the uncertainties. In those nine months we set up the company, secured funding and support from partners, came to an agreement with the University of Canberra, conducted a research and planning trip to the Gulf, ran a selection process for delegates, and put together a nearly-three-week study tour program. And then the tour went off almost perfectly to plan! An ongoing challenge for the foreseeable future will be budgets. As a not for profit we obviously rely on the support of like-minded people and organisations to fund our activities. We’ve been very grateful for the support we’ve received so far — especially from the Department of Foreign Affairs and Trade’s Council for Australian-Arab Relations — but one of our priorities at the moment is diversifying our sources of funding and securing them into the future. Do you have a favourite memory or story you can share about your work on AMEJE so far? Getting on the plane to fly to Dubai for the study tour was pretty surreal — I couldn’t believe that all the planning and plotting had paid off and it was actually happening. But I guess one memory that sums it up nicely is how at the end of every (tiring) day while on tour I would sit down and write a long email to my AMEJE colleagues back in Australia to let them know how the program went. I remember almost every email including some sort of variation on “the delegates thought today was the best day of the tour so far” or “watching the delegates engage with today’s experiences was the highlight of the tour so far.” It was a great feeling to sit down and reflect on how this pilot project was smashing fresh KPIs each day, and to receive such strong and constant feedback from the delegates about the value of the experience to them. 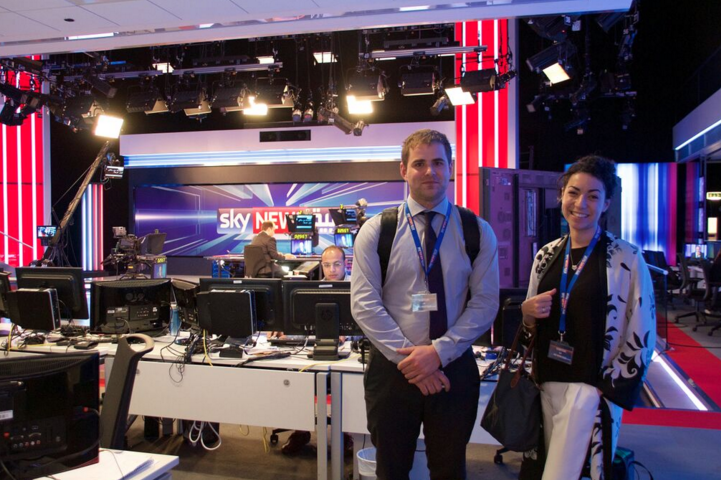 Zac and Scherry in the Sky News Arabia newsroom in Abu Dhabi. What is the most common reaction from media colleagues when you talk to them about AMEJE? Overwhelmingly positive. Those I’ve spoken to are nothing but supportive. What single biggest thing you would like people to learn, know or understand about making things like AMEJE happen? I really don’t think I’m in a position to speak with authority about making stuff happen because I feel like I’m making it up as I go along. While my colleagues and I have worked extremely hard, there’s no denying that in certain ways we’ve benefitted from a healthy dose of luck and fortuitous timing. But I think one bit of advice I could offer is get yourself excellent colleagues like mine who are intelligent, creative and who have diverse expertise. What is the one big goal or dream that you are focused on for AMEJE? I would love for us to one day be in a position where Australian and Middle Eastern journalists’ first thought when putting together a story on the other region was to ping us for help in getting linked up with information or resources. I’m also looking forward to one day being able to watch all of our study tour delegates from over the years putting their experiences to use by producing great reporting as part of their successful careers. If there was one person you could sit down and talk with about AMEJE who would it be and why? This answer is such a cop-out but I’d love to buy someone a coffee who shares our passion for cross-cultural understanding and who might be in a position to invest in the next generation of Australian and Middle Eastern journalists. In five words, how does creating the Australia-Middle East Journalism Exchange make you feel? Pretend adult with business cards. Zac Schroedl and Scherry Bloul are the first delegates to take part in the AMEJE Study Tour, and here’s what they have to say about their experience. Scherry and Zac in Doha, Qatar. What motivated you to get involved with AMEJE? Zac Schroedl: My motivations were gaining practical experience and seeing a part of the world that I knew very little about. Scherry Bloul: From a young age, I have always been interested in cross-cultural interaction. Coming from a multi-ethnic background, I have always taken on a chameleon role in explaining differing points of view. Being interested in multicultural issues, specifically in world affairs and their relation and interpretation in Australia, I have noticed a cultural divide in the communication and interpretation of news. The Middle East is ever-present in the news, and in the West, not often in a positive way. Conversely, the Western world is often viewed with suspicion in the Arab world. It is therefore especially important to be able to, in the best case, bridge the cultural divide between these two worlds, or at the very least to have a better idea of the gap in cultural understandings between these two civilisational areas. I wanted to be able to know more about the Arab world. Also if I hope to work in the region I need an understanding of it. This particular program provides the tools necessary to start developing this understanding. In the Al Jazeera control room with director Alan Adair. You were selected to be part of the 2015 AMEJE Study Tour in the Gulf earlier this year. What was your professional highlight of the study tour? Z: The professional highlight of the tour was interviewing Sue Turton, one of the Al Jazeera English journalists convicted in absentia alongside Peter Greste. I’d hardly slept the night before and had accidentally left my laptop behind at the hotel. So when Scott told us we had the opportunity to interview Sue I was none too excited. I began researching her on my smart phone knowing she was sitting just metres away. It was a strange but enlightening experience. During the interview, she revealed that she would be resigning from the organisation due to her terrorism charges. We had a scoop! Later that evening, my colleague Scherry and I wrote a short article about it which was printed in Fairfax newspapers in Australia. 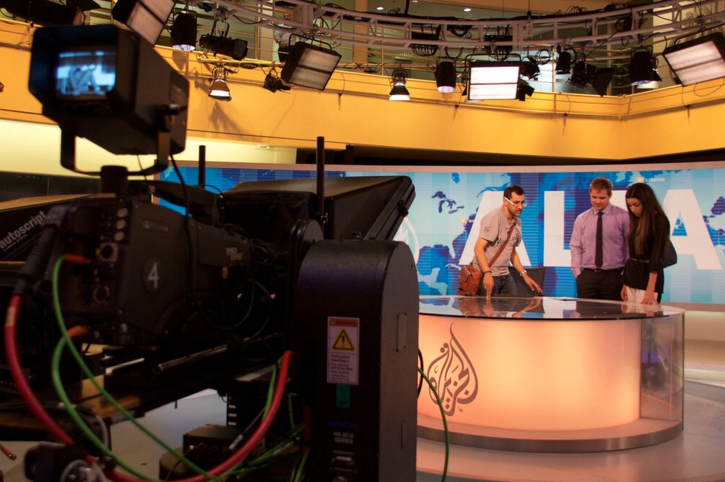 S: Out of all the various newsrooms we visited, most notably Al Jazeera, you could see many of different nationalities and backgrounds working together and, more importantly, contributing different perspectives and points of view to news. You just don’t see the same amount of diversity in Australia’s newsrooms, unfortunately. Whilst at Al Jazeera, the other delegate and myself were able to interview Sue Turton, one of the ten AJ journalists convicted in absentia of the same charges as Peter Greste. We then successfully pitched, produced and published her story — she had to quit Al Jazeera due to travel bans imposed by her conviction. 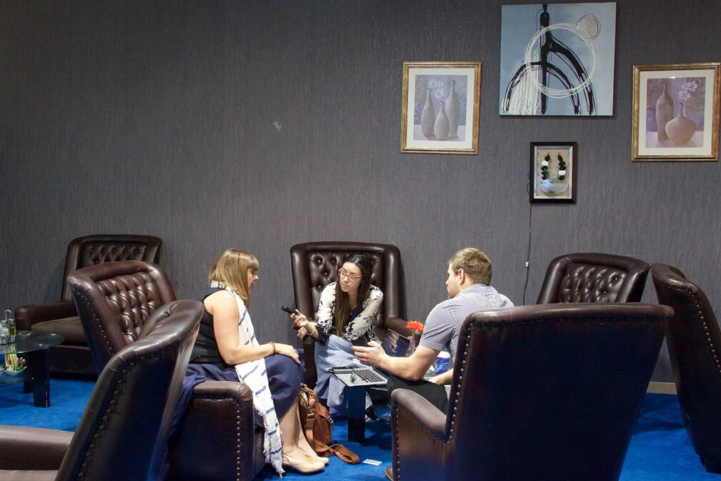 Sue Turton (left), one of the Al Jazeera journalists who was in trial in absentia in Cairo, being interviewed by Scherry and Zac. What was your social/cultural highlight? Z: During the first day in Qatar, we were lucky enough to be taken on a 4WD experience in the desert. I’d never seen anything like it before. Some of the sand dunes were fifty metres high and our driver would accelerate right over them and we’d slide down the other side. Afterwards, we jumped into the warm waters of the Gulf and sand-boarded down the steep dunes overhanging the beach. We dined on traditional Qatari fare and spent the evening staring at the stars and attempting to name a country from each letter of the alphabet. 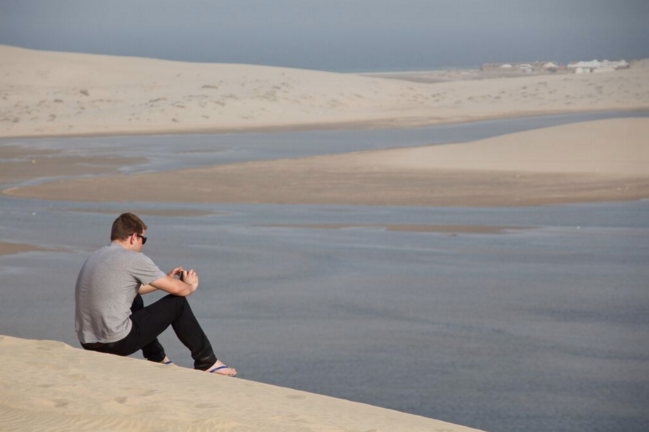 Zac on top of the dunes in Qatar. S: As with any immersion program, meeting locals and mingling with people was the clear highlight. Interviewing many women about life in the Arab world not only broke any preconceived ideas I had about issues, but it also enlightened me to the empowerment of women in the Persian Gulf. Scherry, who volunteered to model Arab women’s clothing for host Dahlia’s presentation, at the Sheikh Mohammed Centre for Cultural Understanding in Dubai. What is the main topic/event/issue you understand more about now, than before the study tour? Z: Media ownership. Since visiting newsrooms and media outlets in UAE and Qatar I’ve realised that organisations will present stories in various ways depending on the political, social and economical contexts of its owners. S: I met many women who live and work in the region and this has led to more research into feminism in the Middle East, I would have to say I understand more about women’s issues and rights in the region. Zac and Scherry in a writing workshop with Al Jazeera presenter Kamahal Santamaria (right). If there was just one thing you would like people working in the Australian media to understand more about Australian and Middle Eastern journalism, what would it be? Z: Do not take for granted the freedom the media has in Australia. Here we can approach a shopper on the street and get a vox pop of them quite literally calling the Prime Minister a wanker. This would not be possible in UAE or Qatar. The state controls much of the media that citizens are consuming, so citizens and expatriates alike are fearful of saying anything that might get them arrested or deported. Operating as a journalist in a non-democratic society would be like swimming with a weight attached to your leg. I admire many of the journos over there who have to deal with a system like that. S: As we know, the stories revolving around the Middle East and Islam have a specific negative narrative. To look past this narrative and attempt to understand the complexity of the history and cultural sensitivities is paramount to at least not rushing to a headline. As a part-Arab who has grown up in this country, the soft-persecution and subtle racism have a cumulative effect that result in feeling devalued. For more information about the Australian-Middle East Journalism Exchange, go to the website ausmideast.org, or follow the organisation on Twitter at @ausmideast or Facebook.